I have attended a number of sessions at day 3 of LSCon, here are my session reports. I attended the morning buzz session of Tracy Parish. She presented (and collected) free elearning resources. Images, tools et cetera. I will not give you an overview. She has an website where everything is listed a must see for everyone who is looking for free stuff. Great work Tracy. Presentation by Hillik Harari and Yanay (I love names that are palindromes) Zaguri. Though their solution is limited to performance support (as in online help with applications) they had some interesting notices. Intersting is that Learner, internship and expert has great resemblance with what by Bob Mosher and Conrad Gottfredson presented yesterday. They call it train, transfer and sustain. I also like the very concrete 9 cells of the matrix. Good stuff. I do think that there are worse rules to live by. Where I found that Clark and his fellows where a bit sour and frustrated when presenting their eLearning manifesto, Clark was at his best today. He painted a picture of where we should go with very concrete steps and overviews. and a ton of cool references to great and interesting books. You can download his presentation here (if you have access to the elearning guild recourses if not here is a download from my site ls14_906_quinn. I’m not sure if I’m allowed to publish this presentation, but I believe it is a must read for you all. I will take you through it, see the slides for details. We used to be able to plan, but that is from the past. The speed of things has increased tremendously. (page 1, slide three). This images shows how we went from a disconnected world, to a connected world and to an integrated world. You need to tap in with the power of the people to keep up. (see his references at page 1 slide 1). Again references to great literature (slide 1 page 2). Then he introduced this model. This is the process we have to support, I believe it will give you some interesting notions if you try to match your learning end performance support to this. 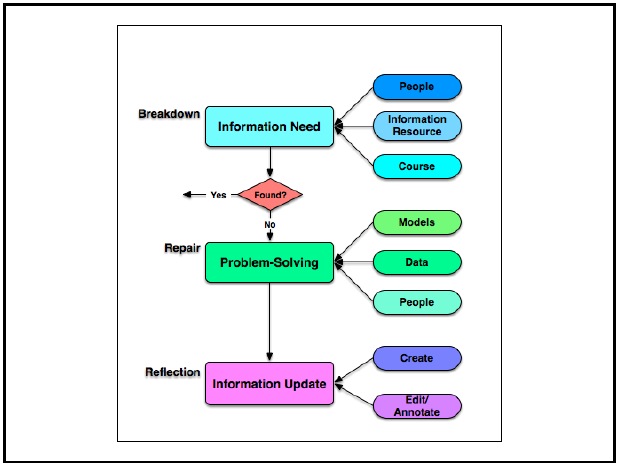 Also interesting to compare this model with the one from Mosher and Gottfredson (see my session report). 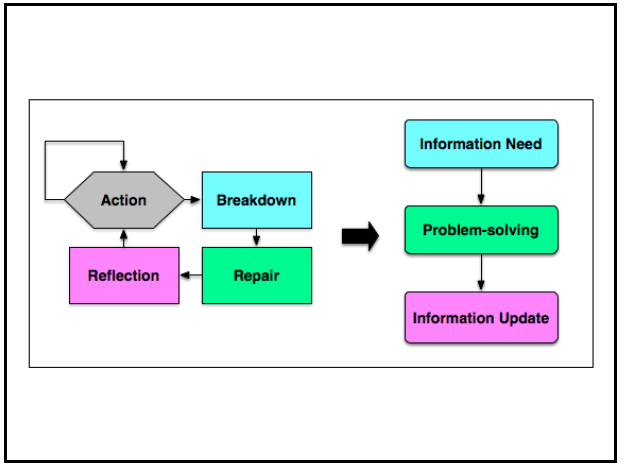 They add training and transfer as phased before sustain, but I do think that if you combine their 5 moments of learning need with this model (Breakdown), you can get even a more detailed and effective model). I will make an attempt, but nor in this post, I have to think and read about it first). Based on the literature list ( see page three), he adds that we need patterns in order to solve problems. He also added a source that is not in the slides: Committee on How People Learn, A Targeted Report for Teachers, Center for Studies on Behavior and Development, National Research Council. I haven’t read it yet, but I will. Social first, performance second and formal as a last resort. Start doing it even when it is just a small thing because “Culture eats strategy for breakfast”, so don’t make a plan, just do it. Be aware of the learning (and forgetting curves) page 5, slide 2. Clark also states that we are on our way to Web 3.0. Web 1.0 was about producer generated content, 2.0 about user generated content, 3.0 will be system generated content. Based on patterns, time and additional information the web will start offering you info. Things like Google now, that alerts you for a traffic jam on your route to work, while you are sitting at home eating you breakfast and without asking for it. Don’t forget to check the literature list (page 8 to 10) all of them are a must read. Keynote by Cathy Davidson. Her subtitle is: How the brain science of attention will transform the way we live, work and learn. She started with the video of Gorilla in the Midst. If you don’t know it first.